Citation Information: J Clin Invest. 2017;127(9):3392-3401. https://doi.org/10.1172/JCI94027. 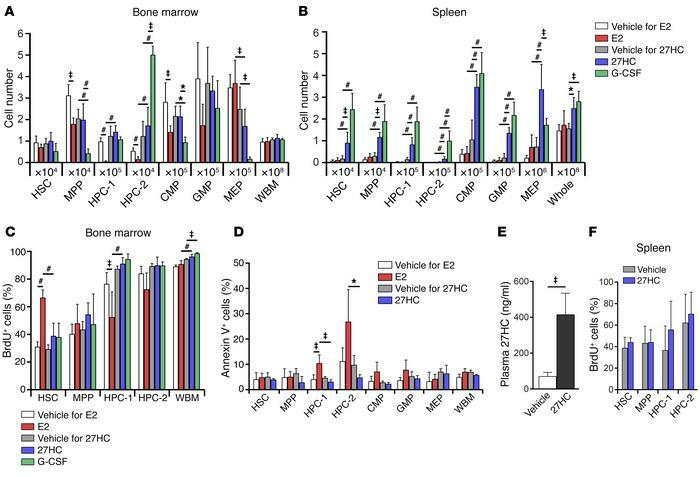 Estradiol promotes HSC division in the bone marrow and 27HC promotes mobilization to the spleen. (A and B) The numbers of hematopoietic stem and progenitor cells in the bone marrow (femurs and tibias; A) and spleen (B) of male mice treated with estradiol (E2), 27HC, or G-CSF daily for 6 days (a total of 4–5 mice/treatment from 5 independent experiments). The vehicle for E2 was corn oil, and the vehicle for 27HC was 2-hydroxypropyl-β-cyclodextrin. The markers used to identify each cell population are shown in Methods. (C) BrdU incorporation into hematopoietic stem and progenitor cells in the bone marrow of male mice treated with E2, 27HC, or G-CSF for 6 days. The mice received BrdU for the last 3 days (a total of 4–5 mice/treatment from 4 independent experiments). (D) The frequency of annexin V+ cells in the indicated hematopoietic stem and progenitor cell populations in the bone marrow of male mice treated with vehicle, E2, or 27HC daily for 6 days (a total of 3–4 mice/treatment from 2 independent experiments). (E) Plasma 27HC levels in male mice treated with vehicle or 27HC daily for 6 days (a total of 5 mice/treatment from 5 independent experiments). (F) BrdU incorporation into hematopoietic stem and progenitor cells in the spleens of male mice treated with 27HC daily for 6 days. The mice received BrdU for the last 3 days (a total of 5 mice/treatment from 4 independent experiments). Statistical significance was assessed using 1-way ANOVA with Šídák’s multiple comparisons tests, with the exception E, where we used Welch’s test (‡P < 0.01) and F, where we used 2-tailed unpaired Student’s t tests using the false discovery rate (FDR) method to correct for multiple comparisons (*P < 0.05, ‡P < 0.01, #P < 0.001). See Methods for details. All data represent mean ± SD.